In 1944, English Electric started to design an unarmed, high altitude, fast jet bomber and reconnaissance aircraft to replace the Mosquito. It first flew in May 1949, with one of the prototypes using the tried and true Rolls Royce Nene engine and the other using the new advanced and experimental Rolls Royce Avon engine. Both engine types are on display in the HARS Engine Hall. The Nene was the last iteration of the Whittle design whereas the Avon was Rolls Royce’s first foray into axial flow design (hence the desire to have an alternative engine should the Avon be a failure). Even by today’s standards, the Canberra just looks elegant and whilst its performance is rather pedestrian today, when it first flew it could fly higher than any fighter currently available and faster than most. The RAAF ordered 48 in 1950 and these saw service with No1, 2 and 6 Squadrons. In honour of Australia being the first export customer the aircraft was officially named the “Canberra” (after the Capital of Australia) by Australian Prime Minister Bob Menzies in January 1951. The Canberra first entered RAF service in England in mid-1951 and Australia’s first Canberra entered service in late-1953, these being built at the Government Aircraft Factory in Melbourne. After the arrival of the F-111 in 1973, No 2 Squadron became the only RAAF operators of the type in the mapping and reconnaissance role until 1982 when newly discovered metal fatigue caused their retirement. Despite the official documentation stating their service ceiling was about 48,000 ft, they frequently operated at 55,000 ft. 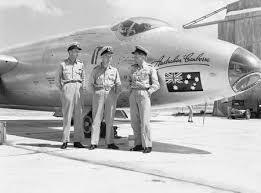 The Canberra served in Vietnam with 2 Sqn RAAF under US Air Force 35th Tactical Fighter Wing Command. Interestingly, the Canberra could carry 6 x 1,000lb British bombs internally in its bomb bay, but in Vietnam the only bombs available were US designed, and only 4 x 750lb US bombs would fit in the bomb bay – the drop tanks were removed and an additional 2 x 750lb US bombs could be carried (1 on each wing tip). The bomb aimer would push the normal bomb release buttons for the 4 bombs internally but had to push the “Drop Tank Release Switch” to drop the bombs on the wing tips. US Commanders in Vietnam regarded the Canberra as obsolete yet the RAAF 2 Sqn Canberras achieved ~16% of the total bomb damage recorded by the 35th Wing but only flew 6% of the total bomber sorties. In reality, the RAAF Canberras were some of the most effective strike aircraft in South Vietnam. A twist of fate which had them equipped with a “bombardier” station meant that they were one of the few types that could do “level” bombing. This was extremely valuable when cloud layers prevented the standard dive run that was normal for more “advanced” types such as the F-100 and F-4. The HARS Canberra was built in Britain in late 1955 as a T4 Trainer and used by the RAF as WT492. She was transferred to the RAAF in mid-1956 and became A84-502. She has a solid nose as a Trainer while the operational Canberra bombers had a Perspex blister for the Bomb Aimers. She spent time with 2 Sqn RAAF, ARDU (Aircraft Reseaarch and Development Unit), Woomera and 6 Sqn RAAF. She was retired from front line service in 1964 and then used as a training aid until 1983. HARS members acquired her in 1983 and she was stored in the open at Australian Aviation Museum Bankstown until brought to Albion Park Rail in 2010 for complete static restoration. Fully repainted internally and externally – her old canopy was white with age so a “brand new” 55yr-old canopy was sourced from England and fitted.